The Church of Ireland Bishop of Cork has expressed his “immense sadness” at the news that Cork city’s last synagogue held its last religious service on Saturday and will now close for good. In a statement, the Right Reverend Dr Paul Colton on behalf of the local Church of Ireland community extended prayerful greetings of solidarity, and friendship in faith, to Mr Fred Rosehill, Chairman of the Trustees and also to the members of the Cork Hebrew Congregation as they gathered with their guests for the emotional occasion. He said that as the Church of Ireland in Co Cork had had to close a number of churches over the years, they “know well the emotions and responses that are associated with the closure of a place of worship; especially a place in a locale that has figured prominently in the pilgrimage of faith, as well as in the big occasions on life’s journey”. 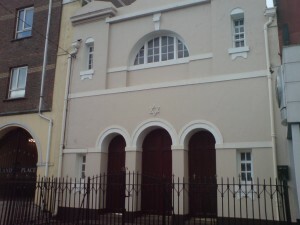 Bishop Colton said that thousands of Corkonians drive or walk past the Cork Synagogue every day. Recalling his own childhood growing up in Cork, he said “I remember well Jewish neighbours and school friends in Cork Grammar School, and how living and learning alongside them taught and enriched me and my contemporaries”. He added that the change in circumstances – demographics and practical realities – which bring about the closure of the Synagogue are sad not least because the closure represents a diminution of the religious pluralism in Cork at a very time when, in Ireland as a whole, greater religious diversity than ever before is a mark of our nation. “I wish all the members of the Hebrew Congregation Shalom aleikhem (peace upon you all) for the journey of faith that lies ahead,” Bishop Colton concluded. According to a report in the Evening Echo, emigration and financial constraints have left the remaining members of Cork’s Jewish community with “no money, no members, and no future”. At least ten Jewish adult males need to live in the city to sustain a synagogue. Cork has just three. Fred Rosehill, chairman of the trustees of the Cork Hebrew Congregation, said: “We are down in numbers. We couldn’t support a rabbi, a Hebrew school, a synagogue. Many of those who emigrated settled in Israel, where Mr Rosehill said there are at least seven Cork families.